Go from the Eni gas station in the direction of Partinico and Alcamo (SP17). 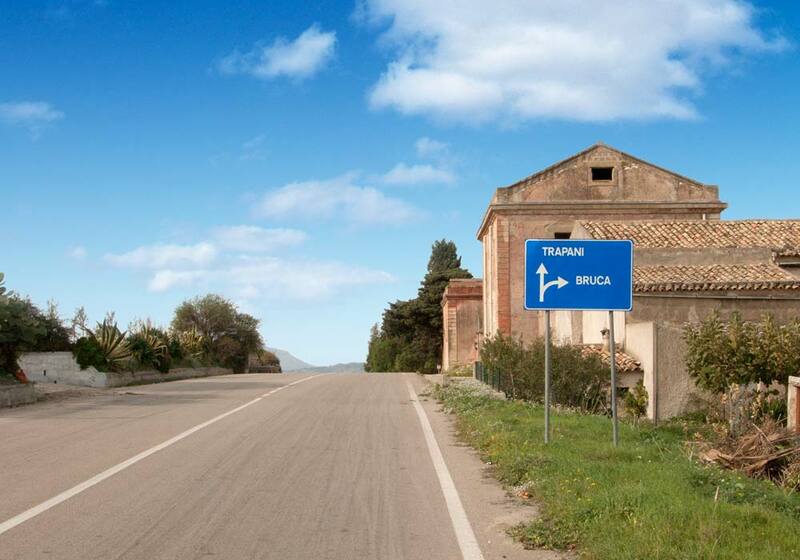 At the end of the road go right in the direction of Alcamo and follow this road (SS113) (*) until you see the exit for Bruca. Go right here. This road is not optimal at this point, but it’s still good enough to pass with a road bike. At the end of the road, just after you have crossed the viaduct over the highway, turn right in the direction of Bruca and Segesta. Follow the road (which passes underneath the railroad) and take the first right in the direction of Segesta (brown sign) and the highway (green sign). Follow this road until you see the exit for Castellammare del Golfo. Turn left here (Contrada Mendola). NB At this point, for about 75 meters, it’s a dirt road, so adjust your speed on the descent. Turn right at the end of the descent in the direction of Castellammare del Golfo and the SS113. Follow this road into the coastal town and turn right on the SS187 in the direction of the coast. Stay on the SS187 until you are close to Balestrate. Turn right here in the direction of Partinico and Contrada Manostalla. At the end of this climb, turn left in the direction of Partinico and the highway. Follow this road until you reach the SP17. Turn left here in the direction of Balestrate. After several hundred meters you’ll see the Eni gas station on your right.